Well okay, yes it is a mitten. 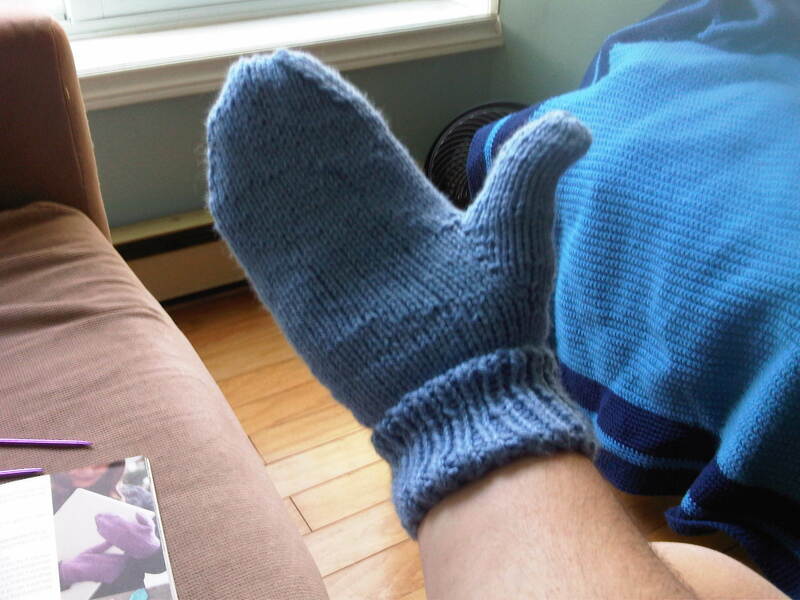 It is a mitten that I made. It is a Knitted mitten that I made. This is important. Other than a couple of terrible scarves and a few swatches done many years ago, I have never knit anything. Before today, that is. Before today, I was only a crocheter, and not from lack of trying. My maternal grandmother tried very hard over many years to teach me how to knit, and my previous lack of skills in this department in no way reflects her efforts. I simply didn’t get it, and our lessons were so intermittent due to distance that I had to be taught what little gains I had made all over again every time. Regardless, I tried hard, and she tried hard, and yet it still never worked. In hindsight I think the neon yellow yarn I remember choosing at age 9 also did nothing to help those doomed projects. Crocheting on the other hand was simple, it is like creating a series of knots and you can only do minor, and easily repairable, damage by loosing your hook. Loose a live needle though, which I would do regularly, and my knitting was unsalvageable. (Although I seriously doubt anyone but myself would have wanted to salvage my day-glow projects anyway…) So, after mastering only a poorly tensioned garter stich, I quit. I went back to my comfort zone with my hooks, the use of which had been taught to me by my mother, but the feeling that I had let my grandmother down a little for not following through on her lessons has stayed with me since. In fact, every time I see or touch yarn I still think of my grandmother, despite her passing over a decade ago and my final resignation to being only a crocheter long before that. The sight of yarn that is not mine always reminds me of asking to borrow something from her stash of primarily blue and pink baby sport weight acrylic yarn for a few of those misshapen swatches (she loved knitting baby clothes because they were fast, and subsequently had a lot of baby yarn). My memories of playing in her house often have her quietly knitting away on something small and acrylic. Even when I feel a lush natural fibre yarn I think of her baby sport weight acrylic, as if it formed the base line in my brain from which I will always evaluate any other yarn. I have noticed that as I have become more proficient in crocheting, my urge to branch out and learn more yarn crafts has grown too. I have been thinking about learning to knit seriously for months, and despite plans to start slow and perhaps make another terrible scarf as a learning tool, I found myself buying more advanced tools and patterns months ago. I still have all the needles that my grandmother gave me (a new pair for every visit as I had invariably left the previous set at home), and those, along with couple balls of her yarn, still live in the little pink plastic Barbie suitcase I got for christmas the year I was 5. I haven’t used anything in that suitcase since I became just a crocheter, but I always moved it with me and kept it accessible. After all, they were the perfect beginners tools for learning this craft again. However, yesterday I got home from work and looked around at my three current crochet projects and felt bored, when what I needed right then was a challenge. I decided that what I needed was to just jump right into doing something that would entertain me by making me think. I needed to play. So I pulled out the new double pointed needles and knit-in-the-round mitten pattern and got to work. By the time my husband was ready to go for dinner I had finished the cuff and was moving steadily up the hand. I was having fun knitting for the first time since I last had the joy of the first 5 minutes of a lesson with my grandmother (before we both got a bit frustrated), and the feeling wasn’t stopping. This afternoon when I got home from yoga my little mitten called to me again. I have other projects with actual deadlines that I should be working on, but this mitten was what I needed to work on today. Every stitch seemed to sooth a little bit of my guilt, and increase my joy. I ended up listening to back episodes of Cast-On by Brenda Dayne, and played with my mitten all afternoon until I finished it. So far I have found one mistake in my mitten, which I am okay with as a first endeavor. Even with that, my afternoon was perfect. I learned new skills through play today, and in the process I feel like I have reclaimed those frustrating early knitting memories and erased my guilt at quitting each time. I did learn to knit, and my grandmother did teach me, it just took a long time and some independent research for the lesson to make sense. So this mitten is not a mitten. It is warmth. It is therapy. It is reclaimed time with my grandmother. It is many things, but most significantly this mitten and all that comes with it are the product of my play, it was fun and good for my soul. « I must learn to knit… immediately.